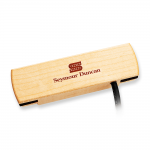 Passive, noiseless, magnetic soundhole pickup that delivers a warm, rich acoustic tone that is great for all types of acoustic playing. It is a hum-cancelling design delivers a fatter, more compressed sound than the Single Coil version. It mounts instantly into your soundhole with no modification of any kind needed to the guitar and can easily be removed.